Major Mimo Blowout Party Weekend! Club Penguin, Chobots & Planet Cazmo! Mimo and CPG are having a couple huge parties this weekend on Mimogames.com! We are having a Skateboard Planet Cazmo party Saturday and a Chobots Rain party on Sunday! Click here and read about the times and stuff! Also don't forget to check out Franktown Rocks. The newest game on Mimogames,com! Go get registered so we can party there too! We will also sneak in at least one (maybe more) Mimo Club Penguin Twitter Quickee Party sometime this weekend. Be sure to follow me on Twitter so you can be ready for the Mimo Club Penguin Twitter Quickee Party! New No Chat Server Game on Club Penguin! Hide & Seek! Some of you wanted me to post this so here it iz! New Club Penguin Pin Cheat - TOY BOAT PIN! Step 2. Now go to the couch. Step 3. Now click on the Toy Boat Pin on the couch! NOW YOU HAVE THE NEWEST CLUB PENGUIN PIN, TOY BOAT PIN! 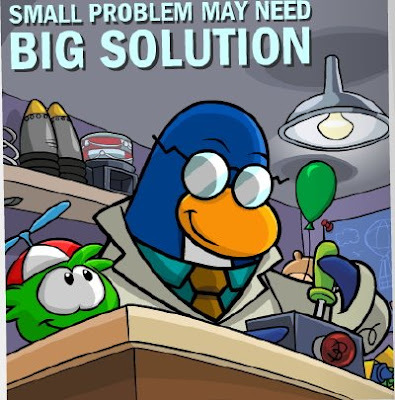 So since the pin usually has something to do with an upcoming Club Penguin event, I'm a gonna guess the Toy Boat has something to do with the Water Party! WEET! lol. ARE YOU FOLLOWING ME ON TWITTER? I CHAT WITH MY FOLLOWERS A LOT! TRY IT! Also at least two MAJOR MIMO PARTIES this weekend! Click here and look at "Mimo's Partys!" New Club Penguin Loo Music - Members Only. I just dig Rocksteady, kinda. But since my membership expired I had to have Me Santa help me. Mimo Club penguin Song Contest Entry! Check out a pretty sweet Mimo Song Contest Entry! Weird gloves though! Sup with that?! Club Penguin has another Reviewed By You this week. If you wanna check it out, click here. Happy77 also mentions the windows in the Underground that Gary will be needing our help fixing. There will be some construction that all you awesome penguins get to help with. Probably like when we dug out the Dojo. It sure sounds like phun! I will be sure to update you as soon as I know something. Also, don't forget to check here for the new pin and updates tomorrow! The Club Penguin Times FINALLY arrived! And there is news of an upcoming party! Saweet! Gary is needing our help again before the windows in the underground pool break and flood the island! I think I smell a water party coming, don't you? I sure wish it would be a new mission, though. We are so in need of one! Club Penguin said they will have more details about the party next week! Also, this is the last week to submit your story for the Penguin Tales writing contest, so get yours in today! Oh yeah, next week will not only get the results of the color vote, we will also get to choose a new item for the Furniture Catalog! I hope it is a hot tub filled with yellow jello! How 'bout you? I sure hope the delay means there is gonna be something really cool in this edition. But, probably not! I will update you as soon as I have more! 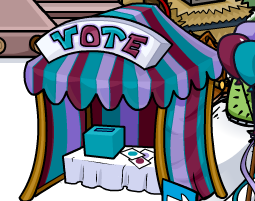 BTW- the results of the color vote will not be announced until the August 7th Penguin Style Catalog! Happy77 has interviewed Screenhog about music on Club Penguin Island. You can read the whole interview here. Be sure and let me know if you try this song out, and on what type of instruments, k? HEY! LET'S HAVE A YOU TUBE MUSIC CONTEST! Sing or play this song on your favorite instrument, put it on You Tube leave me a comment and I'll post the best ones! WOOT! I'm going to get out my kazoo! You can whistle the song! You can Hum the song! You can tap dance the song! Be creative! Make your own instruments! Play the spoons! Play the chop sticks! Play the cheese mallet! Play a meat sandwich! 1. Make a video of you singing or playing this song. 3. Name it "Mimo Song Contest"
4. Post the web link in a comment here. 5. We'll pick the best 3 or 4 videos. 6. Then we will all vote on the best one. 7. The big weiner will get a personal private Mimo Party! Does anyone know how to play the comb? LOL! How Good Is Your Club Penguin Music Jam Party Memory? Now I just have to catch up on all the comments! 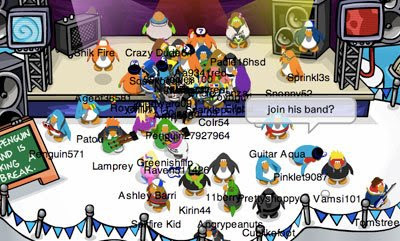 Remember the Club Penguin Jam Party way back a couple days ago? Think so? Ok, then tell me what room is this pic from! First 20 penguins to leave the correct answer in a comment will be posted here! Club Penguin Adds New Servers! Wow! Club Penguin must really be growing! They have added several new servers. Most of them are safe chat servers, but they have cool names anyway. Some of the names are: Dry Ice, Snow Covered, Patagonia, Glacial, and Sasquatch. Sasquatch? LOL. Some of the old servers are now safe chat servers. Be sure to let me know if you notice any other new ones. Club Penguin Music Jam In Your Loo!? 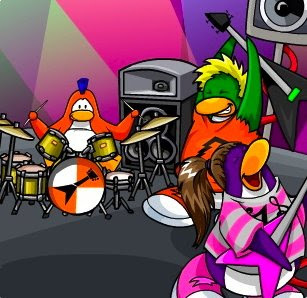 The Club Penguin Music Jam is officially over, but, you will soon be able to jam with your own music! Starting next week, if you have the right instruments, you will be able to continue to play AND hear your music at the Lighthouse stage. Sweet! Not only that, but you will also be able to have the music from the Music Jam in your iggy this Friday if you buy speakers or stereo equipment. That way, you can have your own mini music jam in your loo! Be sure to invite me! ;-) jk, sorry, but I can't really come, but others might want to. What do you think about these musical upgrades? Does playing your own music make Club Penguin more phun? Club Penguin AQUA Mimo Madness and Quickee Party! Have you seen the new postcards yet on Club Penguin? Cool! So yeah, vote for Aqua. If you do, we will have a giant Aqua Mimo Postcard party! AND I'm sure you might know this too but you can log off and log back on to Club Penguin and you can vote again, over and over! Cool! We had a sweet Club Penguin Quickee Party for all the Aqua ppl! WOOT! Check out the pic before it got real busy! By the way, I'm not a member anymore! Boohoo! 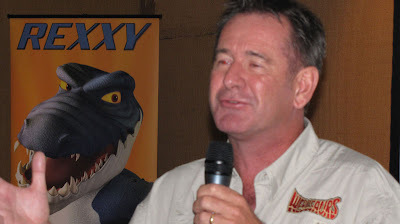 Mimo Rocks Webosaurs Party with Nigel Marven! WOW! 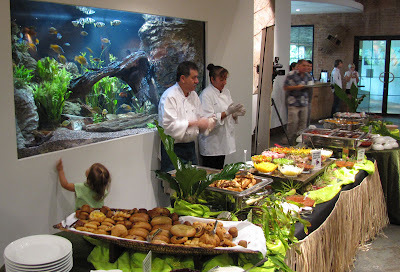 This weekend we went to the Webosaurs party with Nigel Marven at the Dallas World Aquarium! It was awesome! They had food. We played Webosaurs! We just partied! Check out this greeting from Nigel to all of you! 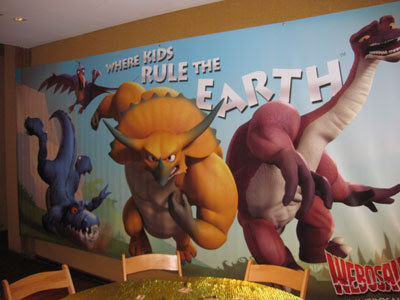 Here are some Webosaurs Party Pics! We met Flyboy! We met Tammy! We met other Famous Webosaur Mods! 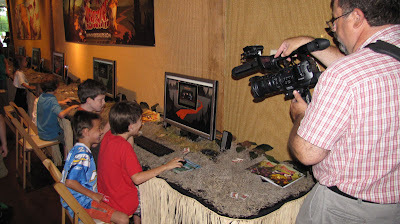 Nigel told cool Stories and will be making more videos for Webosaurs! Ppl got to play Webosaurs! 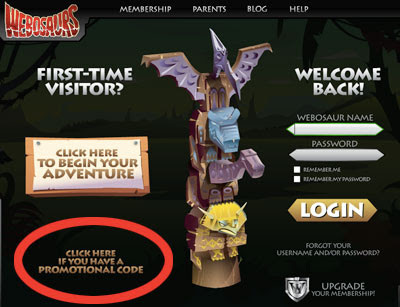 I HAVE A BUNCH OF WEBOSAURS COIN CODES TO GIVE AWAY TO YOU! Follow me on Twitter where I will give them away! Be ready, they will go fast! Here is where you enter the coin code. I think this is reason to have another Webosaurs Party! Check back here for more on the next Mimo Webosaurs party! Ok, here's what I will do if Aqua is not the next Club Penguin Color! If Maroon wins I will post a video of my sisters painting my toenails Maroon! If lavender wins I will post a video of my sisters painting my toenails lavender! Yes, I have gone crazy! 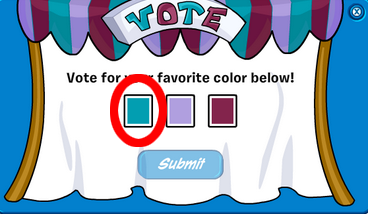 Go to the forest right now and you can vote for the new penguin color on Club Penguinz! These are the new penguin colors: Maroonz, Aquaz and Lavenderz. If Aqua wins, we will have a Mimo Aqua partyz! And I will switch my color from orange to Aqua FOREVAZ! 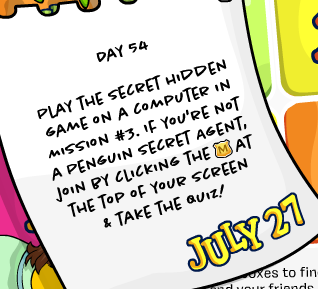 Remember this "Secret Hidden" Game in Club Penguin Mission 3! Remember on Mission 3 you can play Brick Brick game? Well on July 27 on Club Penguin 101 dayz of fun you can go and play that! WOOT! WOW! Super exciting! LOL. 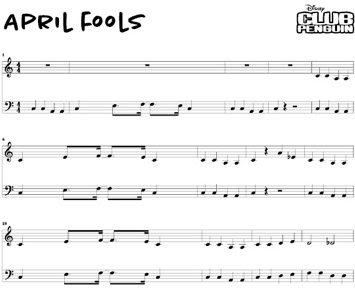 Can't you play that anywayz? But if you are new, Mission 3 is pretty coolz. Check it out. I still think the 101 Dayz of fun is pretty lame-o. U agreez? WHAT ABOUT A NEW MISSION!? HUH!?! Q. Hey Mimo, why did you post this? A. To show how lame-o 101 Dayz of fun is. Q. Why all the "Z"? A. Dunno, I think it's because I recently sniffed a ZZZZEBRA. If you have an instrument, then you should go to the Lighthouse stage! If you play your drums, tuba, trombone, or any guitar, you can actually hear what you're playing. Just wear the instrument (only the instrument and no other items) and dance! The Underground Cave has a floor piano! Step on a key. Oh, and the switch on the wall lets you hear other penguins! There are musical icicles in the Mine. Mouse over them! 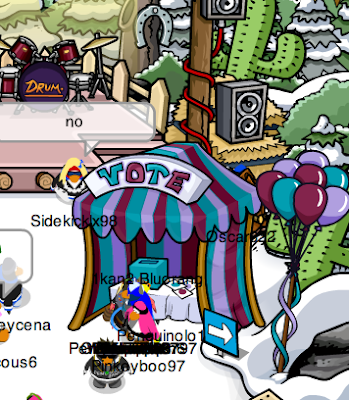 Battle of the Bands at the Snow Forts! The stages are connected to a meter and the one with the most penguins wins! The Music Maker 3000 is back! Last year it was in the Dojo but this time it's near the Snow Forts. Bring some friends and play giant musical instruments. I hope you are all having phun at the Music Jam, but don't forget the Planet Cazmo Mimo Skateboard Par-tay TONIGHT. Let's rock Cazmo! Mimo Planet Cazmo Skateboard PAR-TAY TOMORROW! Ok, how cool is Planet Cazmo? They recently uploaded my Mimo Music! Now you can buy Mimo Surfboards and Mimo Skateboards! So let's celebrate! 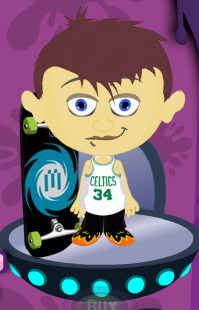 Tomorrow we will be having a rockin skateboard party on Planet Cazmo! Click here to go to Planet Cazmo site at MimoGames.com! Club Penguin Music Jam Changes! Yo, I know a zillion of you have told me, the stage at the Dock is now pink! This is the same sweet change Club Penguin made last year at the Music Jam. Let me know if you find any other changes or cheats around the island! Cool? REMINDER: Vote for AQUA Penguin This Friday! 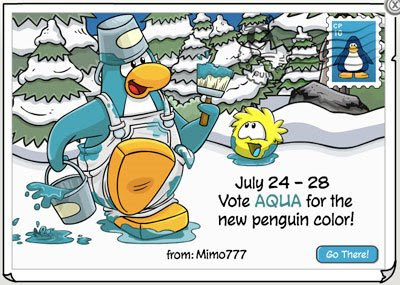 I posted about this earlier but this Friday if you go to the Forest you can vote for a new penguin color. And I guess you CAN'T vote for a zebra penguin. BooHoo! These are the new penguin colors: Maroon, Aqua and Lavender. I'm thinking I'll vote for AQUA because it is kind of a Mimo color! So yeah. If Aqua wins, we will a Mimo Aqua party! Cool! And I will switch my color from orange to Aqua FOREVA! I'm having another sweet party this week, check back for hints and stuff. Mimo Q & A #5 Part 3 Answers! We ROCKED Webosaurs today! So rocked Webosaurs! Club Penguin Cadence & Penguin Band Mimo Tracker! New Club Penguin Pin Cheat - BEACH UMBRELLA PIN! Mimo Party on Webosaurs! Are You Ready?! Cool Colorful News For Club Penguin! 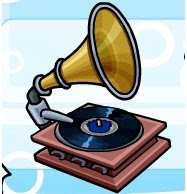 Club Penguin's Happy77 Talks Music Decor! Mimo Q & A #5 Part 2! Club Penguin Music Jam and Penguin Tales Contest! Mimo Q & A #5 Answers! Club Penguin Around The World! Club Penguin Music Jam Sweet Sneak Peek 2009! Did Sensei Fail Coming To Club Penguin This Time? Club Penguin Find Sensei Tips, Cheats, and Hints! New Mimo Comment Tracker for Sensei! New Club Penguin Pin Cheat - DOJO LANTERN PIN!